This Recipe is meant for Boy Scouts, Webelos scouts. Cut sausage in 1-inch chunks. Cut onions and peppers into 3/4-inch strips. Pour oil into dutch oven and heat to 375 degrees for Frying. Saute onions and peppers until onions are clear. Pour in pineapple, including juice. Stew for 35 min at 350 degrees. 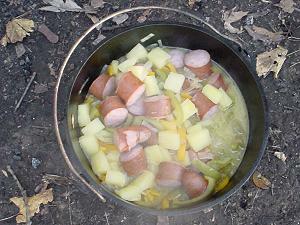 All dutch oven recipes use a 12-inch dutch oven, unless specified. If you have a 10-inch dutch oven, use about 2/3 to 3/4 of the ingredient amounts but keep the temperature and time about the same. Let me know how you enjoyed your Dutch Kielbasa! Send a photo of your meal so I can add it here.